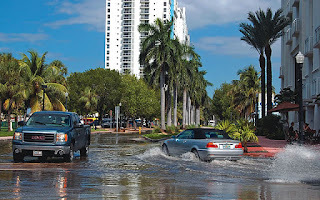 Miami-Dade, Broward and Palm Beach may be underwater in 20-30 years. It is time to consider a re-settlement of the millions that live there. During high tides that have been worsened by sea-level rise, Miami has seen flooding in its Upper Eastside and Brickell neighborhoods. Hal Wanless, the chairman of the University of Miami’s geological-sciences department, has spent nearly half a century studying South Florida. From this, he’s concluded that the region may have less than half a century more to go. The Intergovernmental Panel on Climate Change predicts sea levels could rise by more than three feet by the end of this century. The United States Army Corps of Engineers projects that they could rise by as much as five feet, and the National Oceanic and Atmospheric Administration predicts up to six and a half feet. According to Wanless, all these projections are all too low. “We’re looking at the possibility of a ten-to-thirty-foot range by the end of the century,” he told me. Florida Mayors Tell GOP Climate-Deniers They’ve Had Enough.